On two counts, the Churchill Square redevelopment offers a dramatic improvement on its predecessor. Firstly, shoppers are now sheltered from the ever-charming English weather; secondly, the toilet facilities are reasonably pleasant. The good news ends there, unfortunately. For me, the transition from the old to the new is copied by one from the sublime to the ridiculous. Where the old Churchill Square was grey and battered and crumbling, the new is white and gleaming and seemingly so hygienic that you could eat your dinner from the floor. When it is closed for the night, it is hard to imagine that the slightest trace of human life remains. For those who desire an entirely anaesthetised, blindingly clean shopping experience, this is presumably a joy; for those of us who prefer life without a permanent headache induced by air conditioning and gleaming lights on polished marble, the whole place is best avoided as much as possible. Thankfully, Brighton retains plenty of attractive, welcoming shopping alternatives elsewhere. Even so, Churchill Square dominates Brighton’s shopping areas. And yet it is completely out of sync with the city’s unique character and ethos, as if it were designed for the benefit of people who don’t actually like Brighton, who want to pretend that they’re somewhere else. What could be less ‘Brighton’ than a development full of chainstores, the same chainstores that are found on every high street in the country? What could be less ‘Brighton’ than a building that might’ve been constructed from a flatpack, identical to every recent shopping centre in every town? To be put it more kindly, my Brighton and Hove is elsewhere. I really hate this place, as the article says, it is almost the same as every other out of town shopping center, and designed to keep people inside in a underhand almost hypnotic way. When there are colourful, vibrant and cultured places like the North Laine – who whould want to shop anywhere like this? I quite agree with the above comments. I was living in Brighton years ago and used to meet up with friends at the old wishing well in the square; which I doubt is still there. I have not been there for many years , since I now live in Australia and have done for the last 28 years. I rememeber BHS and all the other shops. I also went to the fist Body Shop opening just off Churchll Square – an old, dark and mouldy shop and look where she is today! I was with a girlfriend at the time and we said she would go a long way and she did! When I used to go Churchill Square in 1974, it at least had character to it – with the rush of people and different shops. But mainly I do remember meeting girlfriends at the old wishing well on a Saturday morning. I wonder if any one else remembers it? Some people will complain about anything! I really do hate this place. They should have left it how it was. It is such a shame it was built in the first place. They demolished some lovely buildings. I have to agree with you guys 100%. I remember the old Churchill Square, and I loved going up there at the weekends. Now I hate going up there; I would rather go to the North Laine. At least it has character! I loved the old Churchill Square. A real haunt for idle teenagers. I also remember falling of my skateboard and it smashing the window of Miss Selfridge. I don’t imagine that sort of thing happens in the new antiseptic mall. Well I think Brightion is quite a good shopping centre, just a bit small! And it could be a bit more entertaining! But apart from that then, it’s alright! A lot of people go there so they obviously like it! When did the new Churchill Shopping Centre open? was it 2001 or another year? I have worked at Churchill Square for 10 years and it saved me from a probably certain death by drug addiction. So despites its apparent high street sameness – look behind the scenes because it’s a lot more interesting than you would think. I love Churchill Square. To be honest my life would be very boring without it. I fully disagree with most of these comments, apart from the beach. People go to Brighton and Hove to go to Churchill Square. Ugh…..shopping malls. Nice though they can sometimes be, more often than not they are bland sheds designed to get hapless “consumers” (we aren’t people anymore, after all) to buy stuff they don’t need with credit they can’t afford. Its a pity to see the UK following the worst aspects of life in the US – going to the mall – although the renovated Churchill Square is a lot better than the original turned out to be. I remember when Churchill Square was first opened in the late ’60s. At first it seemed as if Brighton was becoming a real city but the ravages of the seaside climate on the bare concrete and cheap white-painted steel windows soon turned it into a rather gray and depressing eyesore. I loved the old Churchill Square, which for me growing up in the early 1970s was one big adventure playground! In my opinion, its new incarnation is too sterile and ‘clean’ for my liking. 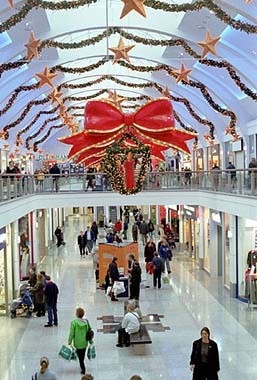 Yes, but you have to admit with the sort of weather we have malls are a Godsend on a cold wet and windy day. We have the best of both worlds with Churchill Square, the Lanes and the seafront. On the other hand Barrie, malls do bring people into the towns and High Streets, which can only benefit the smaller more specialised shops. Rather that than they go to those retail outlet parks which are nothing more than warehouses. A far bigger threat to the High Street is internet shopping. I worked in Mothercare before the new Churchill Square was developed. We had the doors open all year round, and while it was great in the Summer, the square was a freezing cold wind tunnel and not much fun in winter as the tills were in front of the door!